The thesis focuses on appropriate healing garden design for sufferers from post-traumatic stress disorder (PTSD). PTSD can be caused by traumatic experience such as natural disasters or wars. 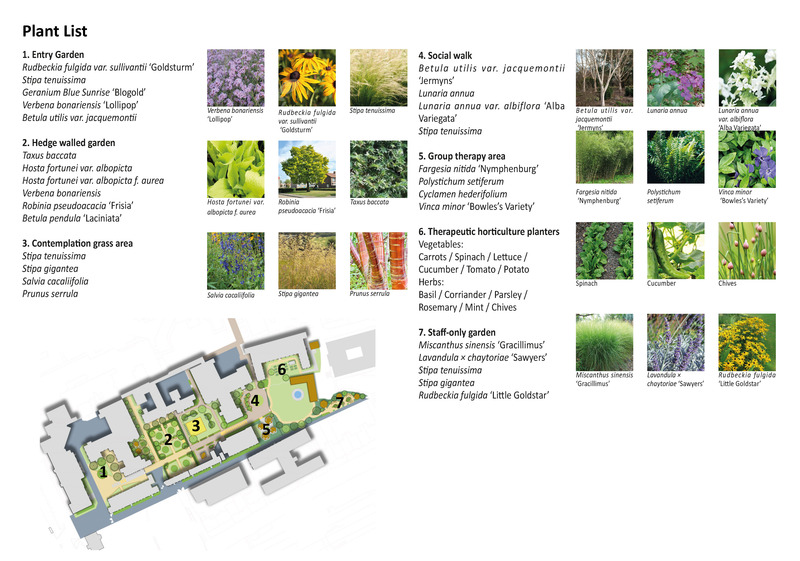 In the thesis, their needs and benefits of gardens in terms of mental well-being have been clarified. 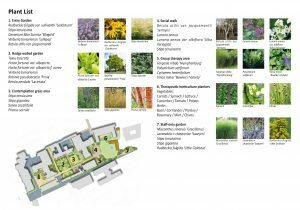 For instance, if the garden provides good prospect (clear views to feel safe) and refuge (sheltered space to feel safe), its visitors’ sense of control can be increased. That contributes to reducing his/her stress. Also appropriate or inappropriate garden elements for PTSD sufferers have been analysed through multiple case study. For example, tall hedge may create someone’s potential hiding space, which may cause big stress in the sufferers. On the other hand, secured outdoor seating space with a variety of scales can provide opportunities of group therapy and other social programs in relaxing natural environment. 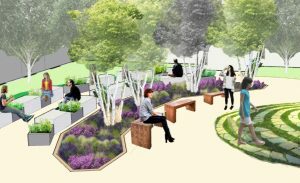 The outcome of the research has been applied to garden design for the site in the Maudsley Hospital in London, assuming its courtyard spaces are private areas only for PTSD sufferers. On this garden design, multi-stem trees such as Betula utilis var. jacquemontii and Prunus serrula have been widely used in order to create good balance of prospect and refuge by their branches. Ornamental grass like Stipa tenuissima moves beautifully by wind and reduces visitors’ stress by its natural phenomenon, therefore it has been used for contemplation space. Subtle scent plants such as lavenders let hospital staff to have refreshing experience in staff-only garden. Raised planters provide opportunity of therapeutic horticulture, fostering social support and taking further steps in their recovery process.